A Taiwanese foundation announced that renowned climate scientist Veerabhadran Ramanathan of Scripps Institution of Oceanography will share a $1.33 million prize with former NASA climate scientist James Hansen. The two scientists received the 2018 Tang Prize in Sustainable Development “for their pioneering work on climate change and its impact on the sustainability of the earth,” the Tang Prize Foundation said. “Their works lay the scientific foundation for international actions [such] as the Paris Climate Agreement. 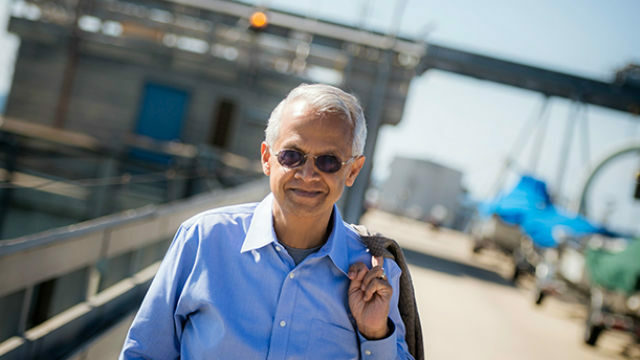 Ramanathan, who joined Scripps in 1990, has pioneered research on sources of planetary greenhouse warming including refrigerants, chemical compounds widely used in industry, and black carbon aerosols such as soot. In recent years, he has turned his focus to areas beyond research, engaging civic and spiritual leaders to frame climate change in social justice terms. Ramanathan is a frequent advisor to Gov. Jerry Brown and is a member of the Pontifical Academy of Sciences, having been appointed to the panel by Pope John Paul II in 2004. Ramanathan said that his being of Asian descent made the award especially meaningful. “This major recognition from east Asia is of huge significance for me and I am deeply honored,” said Ramanathan, who was born in the Indian city of Chennai (then known as Madras) in 1944 and immigrated to the United States in 1970. In 1975, Ramanathan discovered that chlorofluorocarbons, gases then solely associated with the destruction of the ozone layer, were also powerful drivers of the greenhouse effect, and, as such, contributed to climate change. Hansen currently directs the Program on Climate Science, Awareness, and Solutions at Columbia University’s Earth Institute. He gained renown in 1988, when as a scientist at NASA’ Goddard Institute for Space Studies, he testified before Congress that global warming could be linked to an accumulation of greenhouse gases such as carbon dioxide in the atmosphere. Taiwanese entrepreneur Samuel Yin established the Tang Prize in December 2012 to encourage sustainable development.